Carol Breuer, a notably generous donor to Vermont Republicans, has given $110,000 to a Massachusetts ballot initiative that would roll back civil rights protections for transgender people. The campaign leans heavily on scare tactics, as seen in the above logo and its TV ad campaign. In 2016, Massachusetts adopted a law forbidding discrimination against transgender persons in public accommodations such as restrooms and locker rooms. The Massachusetts Family Institute, a right-wing Christian organization, undertook a successful petition drive to put the law to a statewide vote. Breuer has made two gifts totaling $110,000 to "Keep MA Safe," the institute's subsidiary that's conducting the rollback campaign. 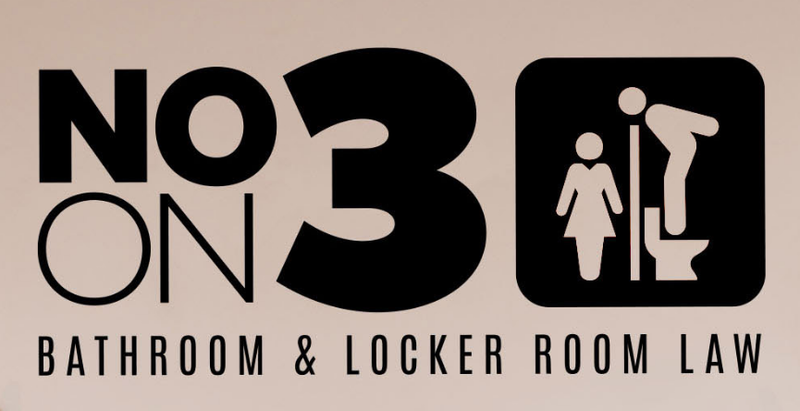 The group's ads show a young woman preparing to change in a locker room while a creepy man looks on from a bathroom stall. Initiative 3 is worded in such a way that a "Yes" vote means upholding the law and a "No" vote means overturning it. "It's disturbing but not surprising," said Cameron Russell, campaign manager for Democratic Vermont gubernatorial candidate Christine Hallquist, who is a trans woman. "Carol and Tom Breuer have a history of funding far-right causes," said Vermont Democratic Party chair Terje Anderson. "They seem to be particularly obsessed with LGBT issues and reproductive rights. The fact that they continue to spend big in Vermont makes me wonder, 'Where do they want the Vermont Republican Party to go?'" "I don't know anything about the Massachusetts initiative," said VTGOP chair Deb Billado. "And I don't comment on donors." Carol Breuer did not return calls for comment on this story.